A browse through our back catalogue of Victorian tankards and glass tumblers and you will notice that one word which very rarely applied to 19th century tankards and tumblers was ‘plain’. The vast majority of examples which have passed through our hands have been embellished in one way or another; engraving, gilding, coloured rims, the application of tinted lenses, extravagant cutting and combinations of one or more . 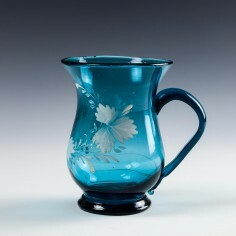 Whole-coloured examples are perhaps the most likely not to feature other decorative techniques, as the more accomplished use of coloured glass would prove to be an appealing feature in its own right, whether through the use of delicate, pastel tints or dazzlingly bright blues and the very popular magenta/cerise cranberry glass. These colours might be enhanced by the use of flashing or cut-to-clear techniques to create striking contrasts with clear crystal elements. Towards the end of the 19th century, more strident colour combinations than ever seen before began to appear; swirling enamelled patterns in green and white, multi-coloured ‘spatter’ or crackle-glass designs, perhaps highlighted with glistening aventurine accents. Perhaps the most striking of Victorian colourways was the advent of uranium glass, the neon-green or yellow material which fascinated a populace who slavishly embraced anything which complemented scientific advancement. There was still room for more traditional techniques, and 19th century tankards perhaps proved to be the most popular medium on which glass engravers could display their talents since the halcyon days of Jacobite glassware in the previous century. Engraved masonic tumblers seemed to be commonplace, along with armorial pieces, scaled-down versions of commemorative designs which also appeared on rummers, and even tumblers bearing engraved chinoiserie designs, something far more commonly seen on porcelain. 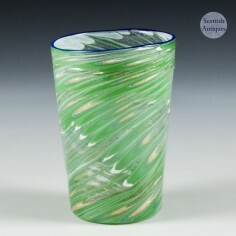 An English Victorian spatter glass beaker with aventurine and cased in clear glass c1880. Available from Scottish Antiques online store. 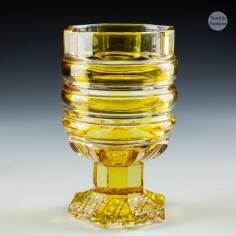 A fabulously cut Biedermeier glass Beaker from c1880. 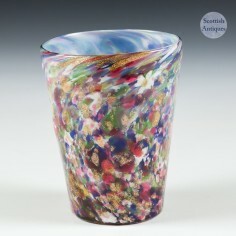 Available fromScottish Antiques online store.